When we first moved to this place, a place of waterfalls spirting from rocky ledges, seasonal color changes expressing New England in its many aspects, diverse forest lands and quaint villages, we explored many places. Yet some of the wonders we encountered were right in the scrub woods surrounding this trailer park. Although the park is located in the midst of three major highways, it has been nestled within a woodland setting…with an additional small meadow out back. At the end of the park drive is a scrub woods with many older trees. It is a pretty wild place with heaved boulders and trees that have fallen from weather or age. When I first came here I used to wander through it and being a rock collector since of I was a kid, was examining rocks. I turned one over and to my surprise find a small nest of redback salamanders squirming in the leaf mold. But these were no ordinary redback salamanders as they were the rare entirely red form. I carefully left the place afraid to disturb them and watching my step all the way out of the wooded area I returned home to tell my husband about my find. That year was a difficult year as it snowed a great deal and so the owners of the park stored piles of sand back there to use for our long drive way out. The next spring you there was no sign of the salamanders and I’ve never seen salamanders there ever since. Although I have had the privilege of being taken to a vernal pool several springs later to see the marvelous dance of the blue-spotted salamanders as they mated. 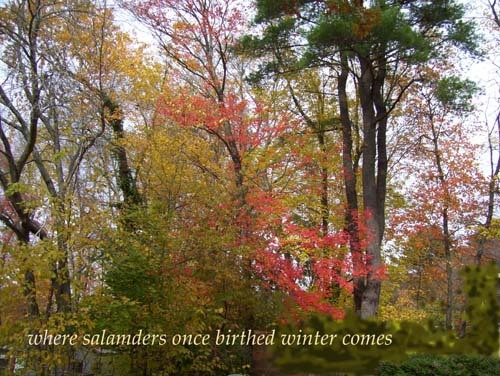 This entry was posted in Haiku, Tanka, and Japanese Forms and tagged salamanders by Miriam Sagan. Bookmark the permalink. After finding those salamanders, I never again considered any square foot of earth as being barren. and there are also those places where sky enters earth. what a transcendent, translucent haiga and poem, this photograph showing just that particular light. thank you, Merrill.